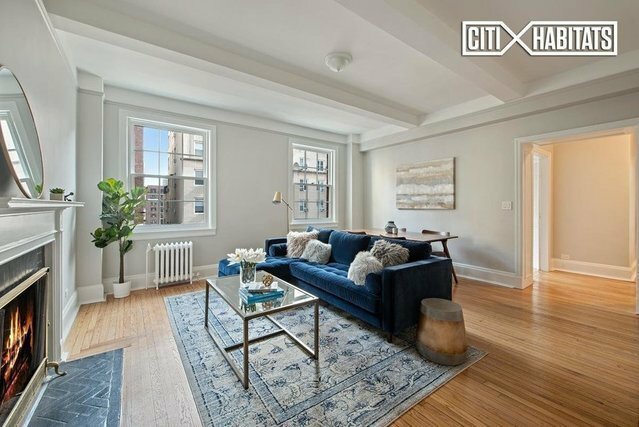 This bright and newly-renovated pre-war two-bedroom in Murray Hill was built in 1923, and provides plenty of historic charm. Well-proportioned, this co-op boasts generous room sizes, 9.5 high beamed ceilings, and a wood-burning fireplace with original mantel. The generous floor-plan features ample closet space and a welcoming entry foyer with coat closet. Every main room boasts two oversized double-hung mullioned windows which allow the sun to pour in all day long. The eat-in windowed kitchen features Quartz counter tops and brand new Kitchen-Aid refrigerator and Bosch dishwasher. With a black and white checkerboard tile floor, the kitchen blends pre-war character with a modern feel. The large main living room features space for a separate dining area. Both bedrooms comfortably fit king size beds with more than enough room for additional furniture. Newly reimagined, the homes windowed bath is complete with vintage hexagonal floors and white subway-tiled walls. Plenty of storage for essentials above the elegant pedestal sink in the mirrored medicine cabinet and in the adjacent linen closet. 264 Lexington Avenue is a beautiful red brick boutique co-op in the heart of Murray Hill. Situated prominently between 35th and 36th Streets with Grand Central Terminal, the New York Public and Morgan Libraries, and the 6 train all only a couple of blocks away. Staffed with a part-time doorman, the building offers a furnished and landscaped roof deck where residents can BBQ and take in the iconic views of the Empire State and Chrysler Buildings. There is additional storage available and residents laundry facilities in the basement. The central Manhattan location doesnt sacrifice a true neighborhood feel. Surrounded by bars and restaurants including Wolfgangs Steakhouse and the famous 2nd Avenue Deli. An AMC multiplex, Fairway Market and Trader Joes are all within easy reach. Dont miss the opportunity to call this Manhattan classic your next home.